These Whole30 Cashew Coconut Chicken Tenders are healthy and delicious! 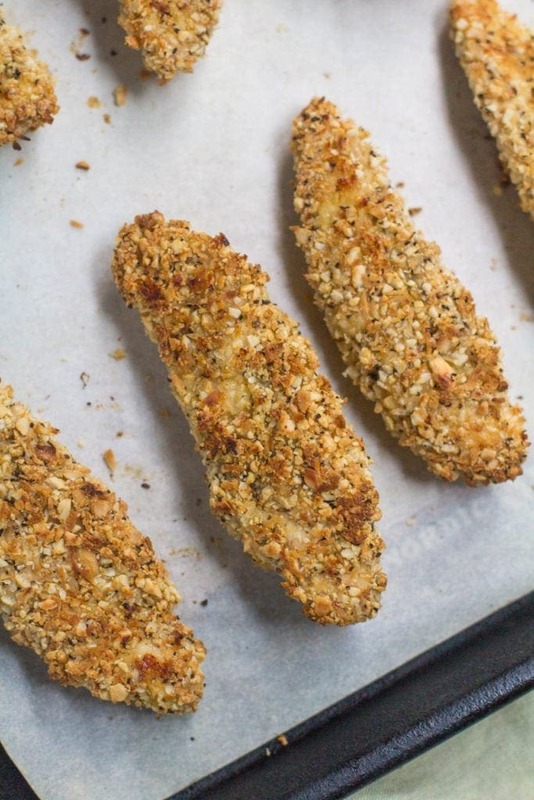 These chicken tenders are gluten free, dairy free, paleo and SO crispy! Ready in under 30 minutes, your entire family will love this healthy take on a classic dish! 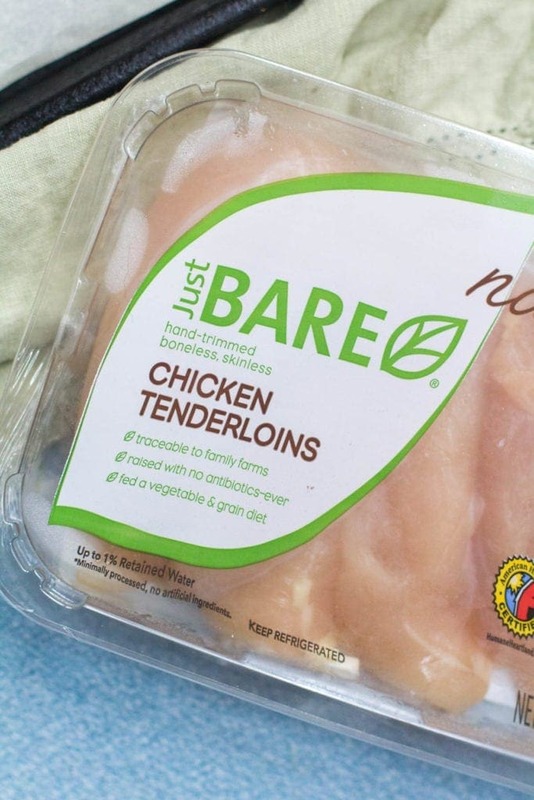 This post is sponsored by Just BARE Chicken®. 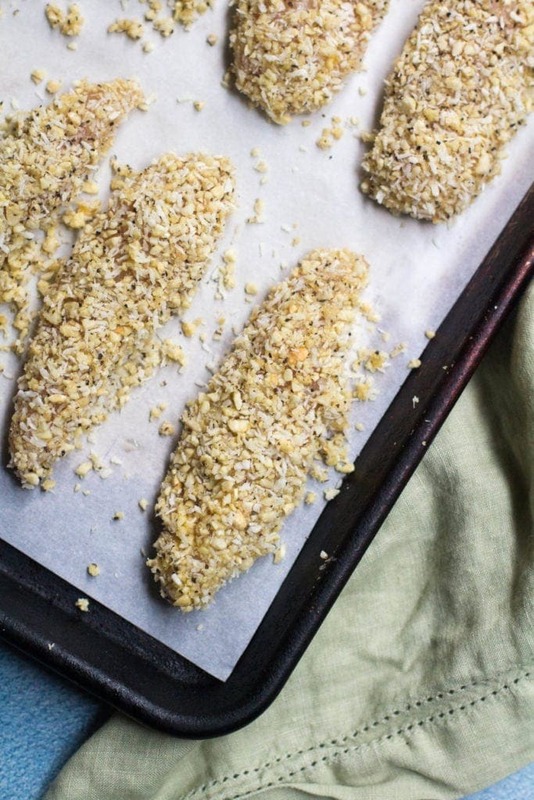 These Whole30 Cashew Coconut Chicken Tenders are the ultimate dinner. 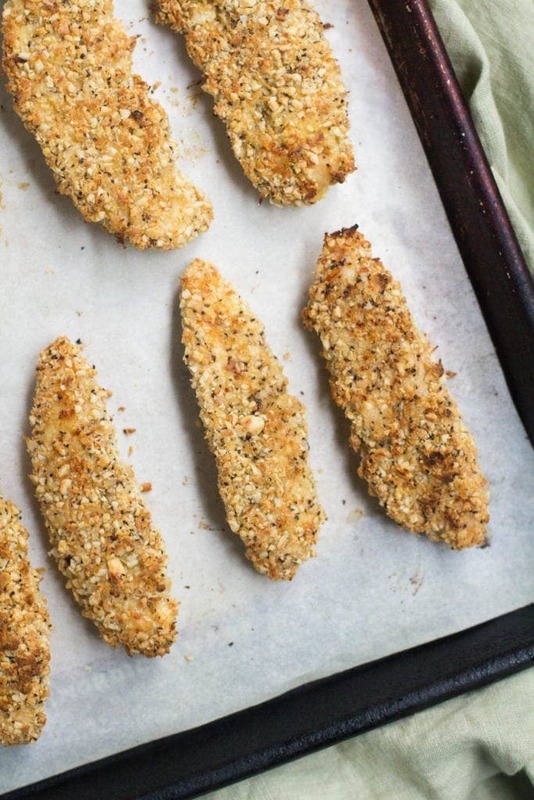 Crispy, crunchy tenders that are baked (not fried) to perfection with a delicious nutty flavor. They are seriously yummy while still being paleo, gluten free, and dairy free. You can trust me on this, because while it might come as a shock, for a large portion of my life I lived off of chicken tenders and french fries. I know, I know. A health food blogger who loves chicken tenders and french fries… believe me, I see the irony here. Growing up I used to LOVE to order chicken tenders and fries when we went out to eat (it was a special treat). Now I’m kind of grossed out at what the mystery meat was inside those chicken tenders… and would much rather make my own at home with good quality chicken and just a few ingredients. You might be thinking.. making my own chicken tenders at home? Too much work. 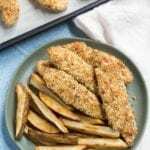 Believe me, I get it, but these healthy chicken tenders only require 7 ingredients and less than 30 minutes of your time to make… believe me you can do it! The most important thing about these chicken tenders is the meat you use. My favorite is Just BARE Chicken Tenderloins. If you remember from my last post where I partnered with Just BARE (hello Caribbean Grilled Chicken, YUM!) all of their chicken promises no antibiotics ever, no added hormones, and is American Humane Certified. 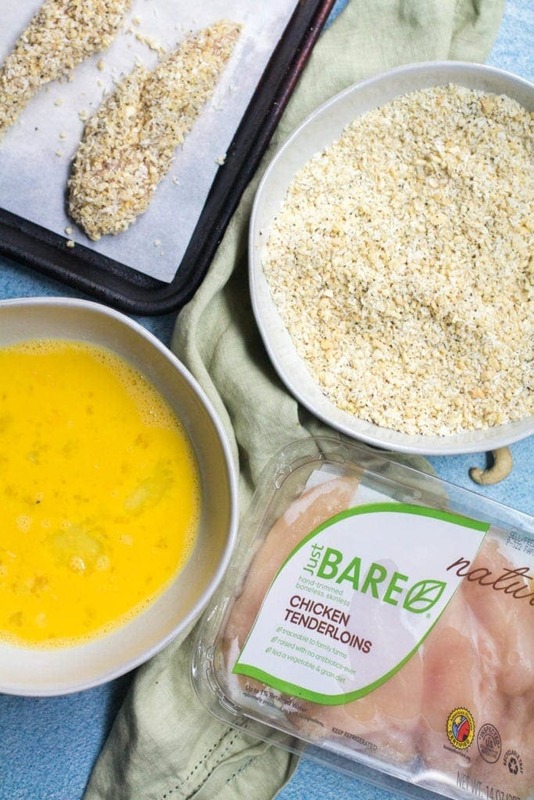 Their chicken is exceptionally tender compared to other brands I’ve cooked with- and it’s perfect for making these Whole30 Cashew Coconut Chicken Tenders with! All you need to do is pulse some cashews in a food processor (I just have a cheap one! ), stir in the coconut and spices, whisk together some eggs, dip in the eggs, dip in the batter, bake and ta-da! You’ve got restaurant quality chicken tenders in under 30 minutes sans the funky ingredients and unnecessary frying! I personally LOVE a meal that takes minimal time in the kitchen and tastes delicious, and these Whole30 Cashew Coconut Chicken Tenders are just that! Simple and yummy! 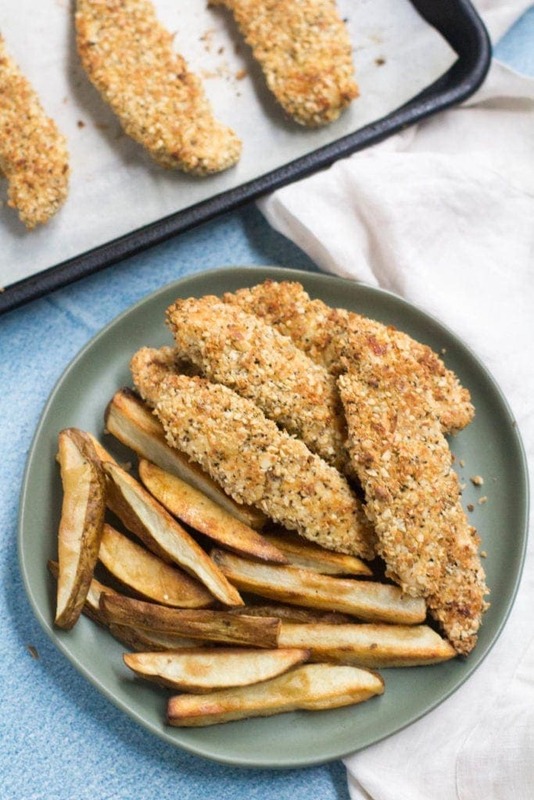 These chicken tenders freeze well (after baking) and are great for picky kids! Even if you’re not strictly paleo, dairy free or gluten free, these are a tasty dinner your whole family will love! These Whole30 Cashew Coconut Chicken Tenders are healthy and delicious! 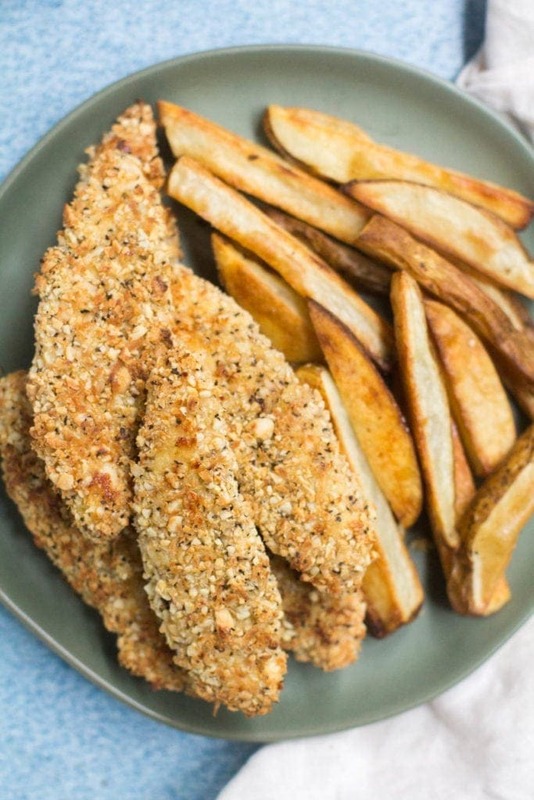 These chicken tenders are gluten free, dairy free, paleo and SO crispy! Ready in under 30 minutes, your entire family will love this healthy take on a classic dish! In a food processor, pulse cashews until they are a finely ground texture. Be careful not to over pulse (see photo for guidance on texture) Set mixture aside in a bowl and stir in coconut flakes + spices. In a separate bowl whisk together eggs. 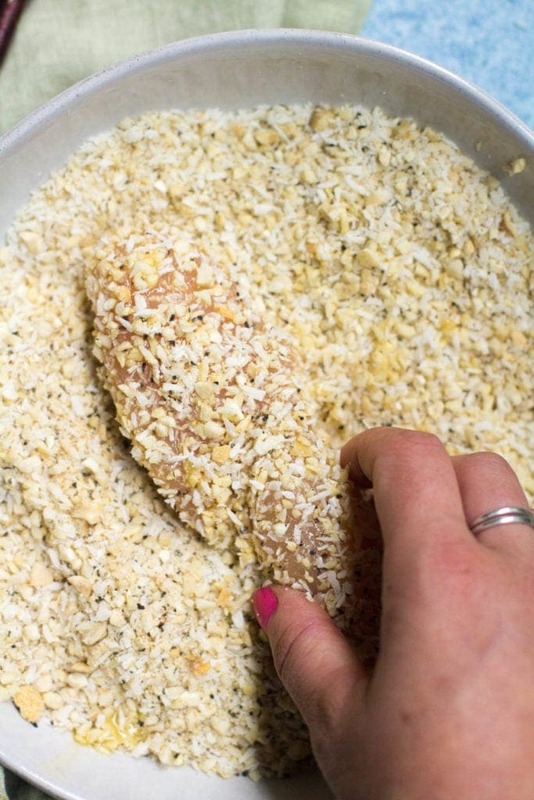 Take chicken tenders + dip in egg mixture, then immediately dip in cashew coconut crust mixture. You may need to really press the chicken tender into the cashew/coconut batter to get it to to stick. We make these chicken tenders ALL the time. They’re so simple and get super crispy. we’ve done a few rounds of whole30 and these are something we make even when off round!! We eat them all the time too, Lori! 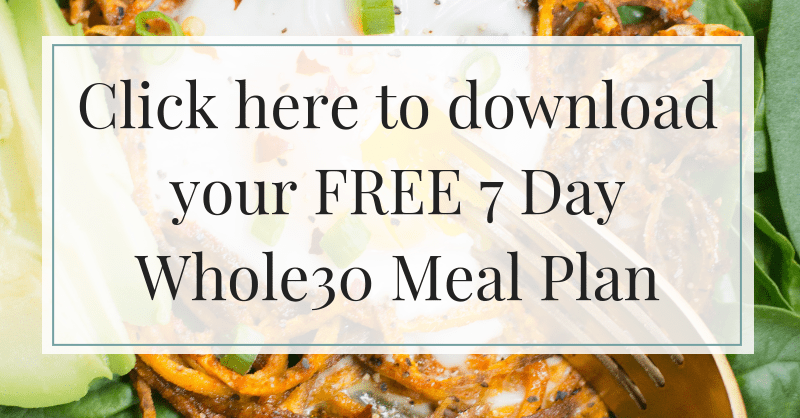 They’re perfect if you’re doing a whole30 and if you’re not! These chicken tenders we’re delicious and came together quickly. Even my husband who is very picky and was skeptical loved them! Yay!! I love hearing that!! Did you make it with the Healthy Baked French Fries too?